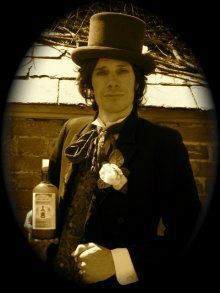 Dr Dusty Russet, purveyor of Russets Homespun Wonder Tonics has arrived in town with his all-singing all-dancing troupe The Ballyhoo Allstars. 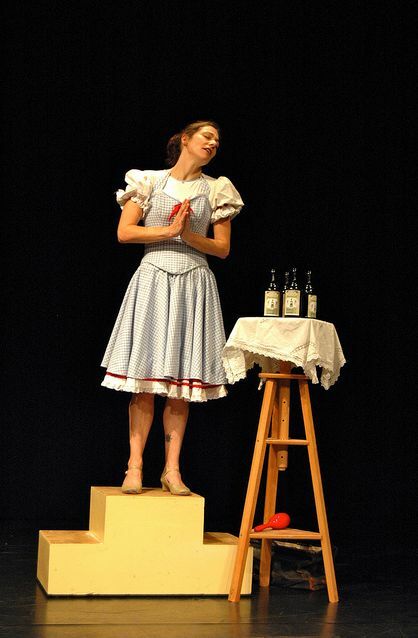 Together they demonstrate the efficacy of his miracle elixirs with some nifty song and dance numbers inspired by the folk, blues and jazz musicians of the depression era in rural America. So step up and let Dr Russet and his companions work their magic. Guaranteed its good for what ails you! 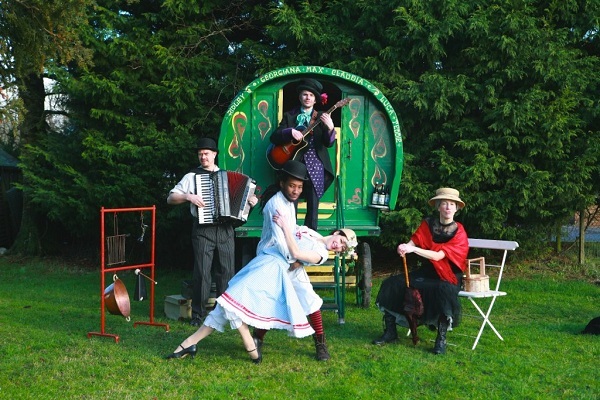 Dr Russets Travelling Medicine Show is a devised theatre piece inspired by the travelling medicine shows popular in late 19thC early 20thC rural America. 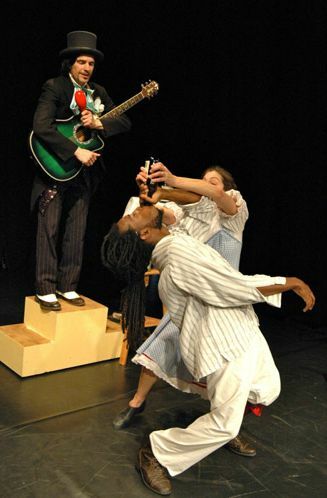 Centred around a doctor (of questionable qualification), purveying a particular brand of medicinal tonics the shows would feature song and dance numbers designed to draw in the crowds and help weaken sales resistance. Some travelling medicine shows employed comedy acts, magicians, snake handlers, escape artists, freakshows and myriad others. The travelling medicine show stage was a place for pure entertainment, not highbrow culture or serious art, aimed mainly at the working class, the farmer and the small-town resident. 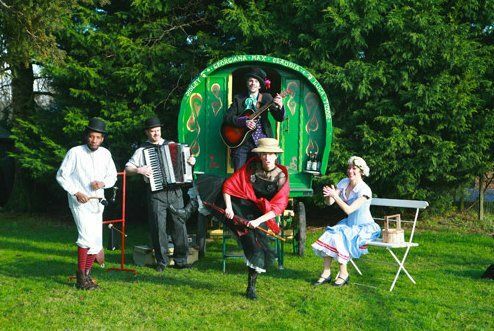 This travelling medicine show is an outdoor show too and is accompanied by a real, antique gypsy wagon and live music. The show is all about audience participation (both singing and dancing) and involves a jolly good fart joke! The piece is designed for families and is perfect for any field, street or market place. 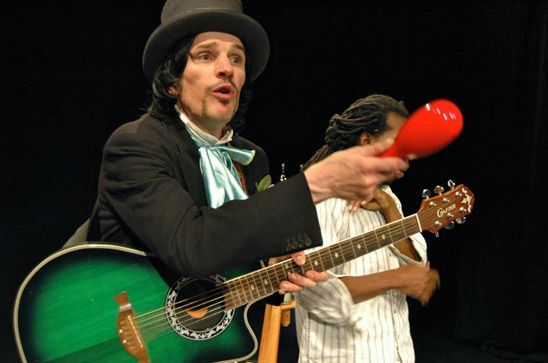 Dr Russet’s Medicine Show enforces the idea that the true power of healing lay in the act of song and dance rather than the potions themselves. Taking inspiration from 1930s jazz, blues and folk, Tap dance and Charleston, Vaudeville and Music Hall, fused with more contemporary influences the cast have created a piece of theatre that offers both a taste of nostalgia, and a reflection on the restorative properties of entertainment and human interaction. 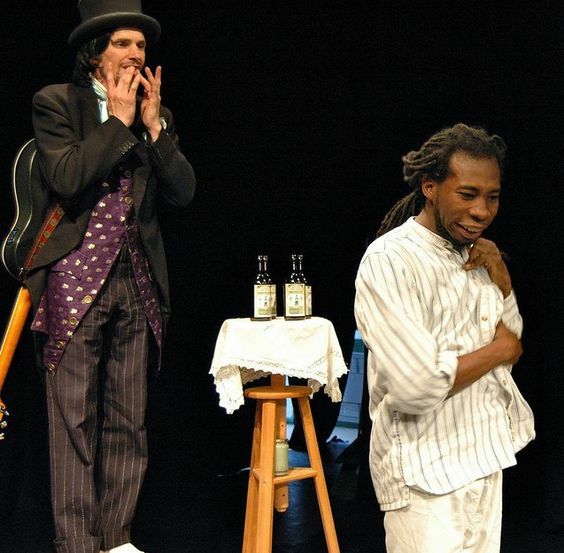 The audience were invited on stage at various points to get involved with fighting malady with melody, and as a result, the atmosphere of the evening was as effervescent as an offering from Russets own Homespun Wonder Tonic. Thank you for a marvellous show. Were looking forward to the next time already! I just wanted to write to say how wonderful Curious were at Buckingham Palace. The pre-concert entertainment was considered to be a great success, and something that the public will remember as part of their special day for a very long time. On behalf of NMEC, a heartfelt thanks for your recent contribution to the dome opening celebration – a truly remarkable event of which we can all be proud, and which I hope will be remembered by you and the 2 billion who watched the event in 100 countries. Following the successful performance of all 11 Big Leaps Giants Steps pieces on Saturday 1st July 2001, I want to thank you for all your hard work and enthusiasm in helping to make the project happen. Thank you for all your hard work on our recent Christmas shoot, we had an awful lot to shoot in a short space of time, and it was only made possible by your hard work and professionalism.